What is the cost of an aluminum fence? How do aluminum fences compare with steel fences? Aluminum ornamental fencing compares very well with traditional steel ornamental fence materials. In many areas, aluminum ornamental fencing is a superior choice. Lighter weight, modular design for fast installation, lifetime finish warranties, and more color varieties mean that choosing aluminum ornamental fencing from quality manufacturers, like Jerith, assures you of a beautiful, long-lasting, durable fence, and at a great price. Can I install an aluminum fence myself? Absolutely. Installing aluminum ornamental fence is not nearly as difficult as you might think. The modular design means that fence panels are pre-assembled when you receive them, making installation simpler. Light in weight, aluminum ornamental fencing panels, posts, rails and gates are easy to handle, and installation requires only tools you probably already have on hand. 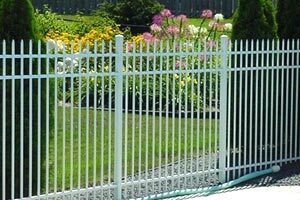 Why three grades of aluminum fencing? Different situations require different fencing. Aluminum Ornamental Fencing from Jerith comes in three primary grades, Residential grade is ideal for most home uses, while Aero Grade is stronger than Residential grade and comes in wider panels. Industrial Grade aluminum ornamental fencing is stronger still, and provides the additional security and strength needed for commercial applications. Are aluminum fences suitable for security fencing? Yes. Industrial Grade aluminum ornamental fencing from Jerith is specifically designed and engineered for security fencing, and has the strength and imposing appearance that deters entry by unauthorized personnel. The heavier materials used in this grade, and security options make it ideal when attractive appearance and strength are needed. Do aluminum fences stand up to harsh weather? One of the greatest benefits of choosing top-quality aluminum ornamental fencing, like the Jerith products offered by our discount fence supplier, is its ability to withstand any weather conditions. From open designs that let the wind blow through to high-tech coatings that have a lifetime limited warranty, along with the tough, rust and corrosion-free materials, weather can’t damage your aluminum decorative fence. Do you supply aluminum fencing for large properties? At our fence company, we can handle ornamental aluminum fence product orders of any size. From a fence to enclose a single swimming pool to a security fence around a housing development or corporate campus, our supply store is your best source for fencing supplies, no matter how large or small your project is. Are automatic, motorized gates available for aluminum fences? A wide variety of gate designs is available for aluminum ornamental fencing. From swing gates to cantilever gates, Jerith commercial aluminum ornamental gates are compatible with automatic gate operators. Our fence consultants can walk you through all options for any automatic gate operation installation. Do you have aluminum fencing for swimming pools? Aluminum ornamental fencing is perfect for swimming pool enclosures, from residential to commercial use. The Jerith 200 Series designs in most styles, which include a bottom and top rail, are often chosen for this application. Self-closing and key-lock latching gates are additional features that provide additional safety, along with the beauty an aluminum ornamental fence adds to your pool area. Can you build an aluminum fence on an uneven, hilly property? In most situations, the design of the fence panels of the aluminum ornamental fence products we sell allows your fence to conform to the grade of your property. There are extreme cases where other solutions may be needed, but they are rare. Why choose a Jerith aluminum fence? When you choose a Jerith Premier Aluminum Fence, you get the years of experience in engineering, design, and manufacturing from the leading manufacturer of aluminum fence. As the only fence manufacturer to extrude its own fence materials in a dedicated facility, Jerith fences offer high-tech titanium-bearing aluminum and an exclusive multi-layer FencCoat Powder Coat finish that has a lifetime limited warranty against cracking, chipping, and peeling. When you buy Jerith, you’re buying the best, made right here in the USA. Are aluminum fences strong enough? Each grade of Jerith aluminum ornamental fence is designed to handle specific requirements and needs, and experience has influenced the engineering of these fences to provide strength, durability, and stability to match how the fence is used. Aluminum ornamental fencing is anything but flimsy, and can meet any fencing need at your residential or commercial property. Can I custom design my aluminum fence? A variety of options is available for every style and grade of Jerith aluminum ornamental fence. From a choice of four colors for most styles and ornamental and security post caps and finials, to gate designs, decorative scrolls and other options, you can make your fence uniquely yours. At our discount aluminum fence company, we’re dedicated to supplying top quality fencing products at the best possible prices. We’ve carefully researched the aluminum ornamental fencing industry, and have chosen Jerith for its quality, long-life, quality engineering, and value. You’re sure to find a Jerith aluminum decorative fence that is a perfect match for any residential or commercial fencing project. Contact us to discuss your fencing needs, and one of our seasoned fence consultants will be happy to help you with your order, answer all of your questions, and provide a price quote that competes with any supplier. Timely shipping, complete, double-checked orders, and top-quality fencing are always assured when you order from our fence store.